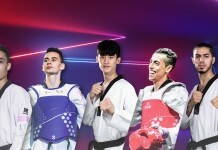 Aged 22, he cites his major competitive achievements as bronze at the World Championships and silver at the Samsun Grand Prix – then his chance for glory came in front of a hometown crowd in Mexico City at 2015’s Grand Prix Final. 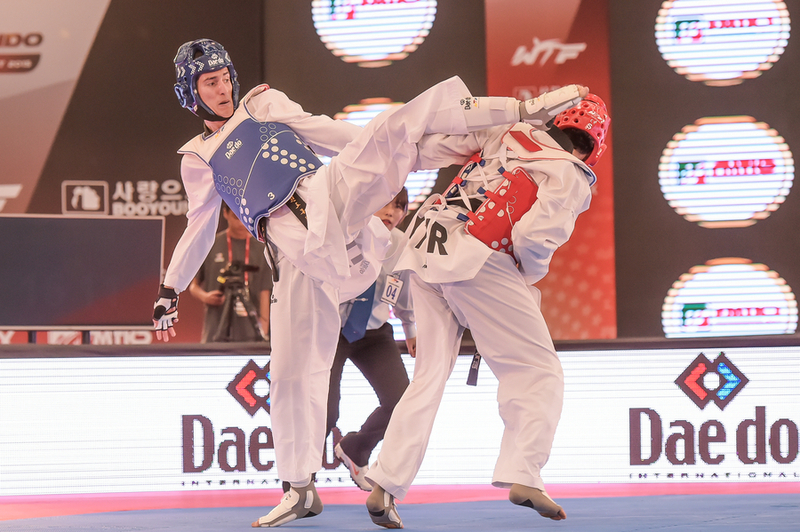 In the final of the male -68kg division – one of the sport’s most competitive categories – he faced off for gold against Korea’s Dae-hoon Lee. “The Spine” was taller, but it was Lee who piled the pressure on early, attacking forward with a stabbing side kick, varied with turning and oblique kicks. Lee went one up, then two up, then three points up with separate body kicks. Round 1 ended 3-0 to Lee; Gutierrez looked frustrated. In the second, the Mexican used his height and leg length to his advantage, connecting with a head kick for three points, evening the score and delighting the crowd. With both fighters raising their work rate, the board rang up 4-4. A head kick appeal won Gutierrez a further three points, ending the second round ahead, 7-5. Round three started with a well-conditioned Lee looking dangerous as he tried to force the Mexican off the mats. Gutierrez was dropped to the deck and Lee closed the gap to a one-point difference – then scored again, evening the board to 7-7 at the end of the third. That took things to golden point but it was Lee who looked fresher as the two came out. The Korean connected with a body kick, earning golden point and gold medal. He was rueful about his loss to the Lee – one of the most consistent fighters in the sport as well as one of the most popular, having twice been voted the WTF’s “Man of the Year” by his peers. “Against Dae-hoon I felt good, I was doing the right things, but I got tired at the end,” “The Spine” said. As a head-hunter himself, Gutierrez is a crowd-pleasing fighter. “My favorite techniques are face kicks,” he said. “I like spinning kicks but I don’t do them; for my height, they are difficult to do, I am a little bit slow.” He cites his height and flexibility as his best physical attributes; when it comes to mental game, he says he is patient and cool under fire.